The lightweight, standalone virtual reality headset Oculus Go is finally here! Back in March, participants at the Games Developer Convention in San Francisco had the opportunity to test the upcoming Oculus Go virtual reality headset and most of them loved it. 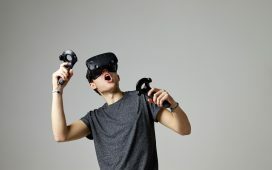 Now, VR fans from all over the world can order the device and enjoy a new way of experiencing immersive games and videos: untethered and without feeling the weight of the device placed on their head. Oculus has been working with various partners, including Xiaomi and Qualcomm, to create a virtual reality headset that offers superb, realistic images without being too bulky and heavy. The new device is made from lightweight, breathable materials, with adjustable straps and comfortable pads made of injection foam. These pads easily adapt to the wearer’s facial structure to ensure perfect visual insulation without causing pressure or pain. These characteristics allow VR fans to enjoy immersive experiences for a longer time, without feeling fatigue or the weight of the device pressing on their heads. a built-in lithium battery offering 2 hours of gameplay or 2.5 hours of media and video streaming. Oculus Go is compatible with Gear VR, which means that the whole range of games (over 1,000 titles) developed for this platform can be played on the new standalone virtual reality device launched by Oculus. In the Oculus Room, they can join their real life friends in a virtual environment for social interactions and game play. With Oculus Venues they can get a first row view of a wide range of events broadcast in VR, such as concerts, sports competition and live stand-up comedy shows. With Oculus TV they can enjoy their favorite TV shows broadcast on networks such as Hulu and Showtime–more partners (ESPN being one of them) being added later in the year. $249 with 64 GB of storage. At the moment, the new virtual reality headset is available for sale and shipment in 23 countries worldwide, on the Oculus store, and on Amazon, Best Buy and Newegg.